IF I TOLD YOU where we fished for three days in mid-January your life would be in danger, because sometimes it can be perilous to know such secrets. In danger, too, would be my own masculinity, for, sure as Sage, my compadres-in-rod would come after me also. So let us just say, after Papa Hemingway, that the river was as big and as wide as a good river should be, and that the ratio of trout to water was favorable, if not to the trout then surely to the angler. 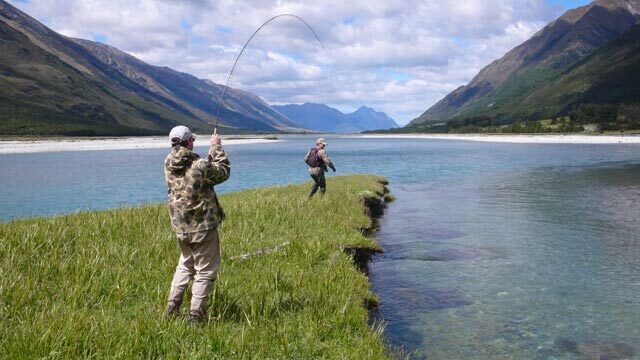 But let us also add, leaving Papa to his vices and devices (since we have long ago moved from impaling grasshoppers on hooks and calling it fly fishing), that this lower South Island river had enough side-creeks and spring-fed backwaters to provide textbook sight fishing. This was to be its saving grace during our visit, as the river itself was far from being at its best, running the color of milk put into a Bombay Sapphire bottle, and so high even some of the side creeks were marginal to cross in a Landcruiser with the snorkel higher than your head. There were four of us in that truck. David Lloyd, my regular riverside buddy, was back again from Asia for his fix of fly fishing, and this time he had brought a friend named Mike Brady, an initiate to this game of trout. Then there was yours truly and Craig Smith, a champion bloke and a competent outdoors all-rounder who once gained notoriety when he wrecked his sea kayak off the coast of Banks Peninsula and saved his life with an epic swim that was front-page news across the district. Craig guides this river regularly if infrequently, and it was his call whether we should attempt the crossings or not. He tested some of the creeks by wading them all the way across, looking for holes, soft spots and other hazards. “If I can wade it I can drive it,” he said, and this struck me as a good rule to remember. I had only recently backed off from several such crossings, not so much mistrusting my own Landcruiser but my judgement. Craig’s own river sense was finely tuned and tested in battles. After a particularly gnarly crossing, in a place where several years ago a Land Rover was swept away and its driver drowned, he told us how, getting across the Cascade River south of Haast, his truck side-drifted in the current for some ten meters before it clawed its way up and out. Inside the car, both Craig and his passenger were wearing life jackets, a lesson from another incident in the Cascade when, during a similar crossing, the Nissan 4WD of the local farmer became a river-bottom attraction and, no doubt, a home to eels and trout. After a few hours of low-range grind we got to our base in an old cowboys’ hut. Mike and David had each caught five-pound browns from one of the creeks we fished before we crossed it. Craig and I had landed fish too, and they had all seemed eager and easy, and we thought it augured well for the trip. If we had only know just how well. Though the level of our experience varied greatly—it was Mike’s first fishing trip, while Craig had fished this river for more than a decade, and he flown into it, and drove and mountain biked and walked its entire length, with David and me falling somewhere in between, none of us was prepared for the spectacle, the sheer visual impact of fishing to trout which had obviously not seen an angler for a considerable length of time. You’d think that on a small creek or backwater four would be a crowd, but this time it was not so. Perhaps the rains and spates which had plagued us from the beginning of the season had pushed the fish out of the main flow and into the side creeks, for we found trout in most pools, either actively nymphing in current bottlenecks and on lips demarcating sudden changes in depth, or lying just under the surface feedline, eyeing all objects passing overhead, some of which were our Wulffs, beetle, and cicada imitations. Each time we spotted a fish there would be the usual overly polite banter as to whose turn it was, and when this was decided the rest of us settled back to watch, as if from ringside seats. The audience would fall silent, and if the cast was good there were distinct acts to the drama that followed. The fly, usually one of the aforementioned terrestrials, would land with a plop, and as it began to drift downstream we often caught ourselves holding our breaths. There would be a decisive moment when the fish saw the fly, when it recognized it as an article of desire and decided to have it. You could see it in its body language, in the change from the languid and relaxed swaying in the current to a snap of senses and a sudden tension—the excitement and anticipation of a predator zeroing on its quarry. From this moment on, the fly and the fish were on a collision course and, more than once, the trout was lifting through the column of water—a meter or more—with its mouth already open, an indelible memory. As the fish took the fly, there was often an audible smack of its jaws, followed instantly by a chorus of gasps as we spectators finally remembered to breathe. The fights and landings seemed a routine necessity, a wind-down from the climax of the take itself. Only once, a fish Craig hooked in a bush-edge pool tried to wrap him around an underwater boulder, but he followed it valiantly through the deepest water, undoing a knot in the making, eventually netting the fish and giving himself a tidemark that reached well above his hips. It was almost the end of the day, and one of its last pools, when we came across my fish, one that I shall not forget for as long as I can cast a fly. We were walking a high clay bank, a miniature cliff top almost, when all of us saw it simultaneously: a bulky brown shape barely under the surface, where the steep bank and the water met. There wasn’t much spotting involved—the fish stood out like a half-surfaced submarine in an empty seascape—but it was well out of the feedline and did not appear to show any interest in passing food. “Maybe he needs waking up with a big dry,” David suggested, and we all agreed it was a fine idea. By this time I had become something of the team’s sniper, and so I was voted to cast to this fish, even though it wasn’t exactly my turn. It would have been undemocratic to argue, and so, on the edge of the high bank I got down to my knees, pulled enough line off the reel and let the current straighten it downstream. I am an impassioned unbeliever in false casting, especially when the water is so clear it can make you feel an onset of vertigo when you look into it. I have seen enough touchy fish spook even before the fly landed on the water and they had a chance to see it. What I like to do is to measure out my line, putting one cast well behind and to the side of the fish to judge the distances and angles so that the cast that really matters—the first one the trout will see—is as accurate as it can be. This time, too, such an approach seemed a sensible strategy. And then it happened. My fly landed well downstream of the fish and near the other bank of the creek, more than five meters away, and I was about to pick it up and recast to where I wanted it to go, when the fish became visibly agitated. Not spooked—this much we already knew from watching the body language of other fish that day. As if in suspended animation, the trout pivoted and shot towards the floating Wulff, downstream and across the entire creek, and nabbed the fly with a take as decisive as a punch. The suspense was such that if you’d played the theme music from Jaws, with its accelerating heartbeat rhythm, the whole scene could not have been more dramatic. I had enough sense—just—to wait until the fish turned before I lifted the rod and jumped to my feet. The fish exploded out of the water in total surprise at our ruse. I heard yahoos and expletives of jubilation, and I’m sure some of them were mine. There was nowhere to land the fish for a good two hundred meters, and I walked it downstream, holding the rod high, until we could get down the bank, where Mike helped me to net it. Only Mike seemed a bit confused by this fuss. He was clearly happy, but not quite as elated as the rest of us. Mike made a face of surprise. We laughed at such innocence. He was certainly in for a crash landing when we got back to the real world and normal fishing, but what an introduction to the joys of trout! At night we ate venison back steaks, acquired during Craig’s most recent foray into the bush, garnished with sautéed asparagus tossed on top of the meat like disheveled pickup sticks. We had red wine and Isle of Skye peat water, and as we sat around the open fire, long silences began to creep in into the conversation as each of us, in the privacy of his own mind, was already replaying the memory clips from the past two days, each clip a trophy and a keeper. Then something distracted us. It was a faded picture hanging above the fireplace. It showed an old man holding a trophy trout, long and fat like a distended football, and the engraved plaque explained that the man, one John F. Aitken, now deceased, fished and loved this river for 50 years. Above the picture, crossed like real-life coat-of-arms weapons, were two fishing rods, presumably his, and stuck into the guide eye of one of them was a stub of a cigar, thick as a thumb, burnt out and extinguished like the man’s life itself. A golden band proclaiming it was a Macanudo, a Dominican brand, ringed it like a signet. We assumed the cigar was his too—either the last one he smoked, or his favorite brand, it did not matter. What mattered was the thought of what it would be like to fish a river like this for 50 years, to get to know its moods and secrets the way Roderick Haig-Brown got to know his Campbell; this river which, after only two days of fishing it, we already considered the best we’d ever known. Same time next year? It was settled. Copyright © 2011 Derek Grzelewski. 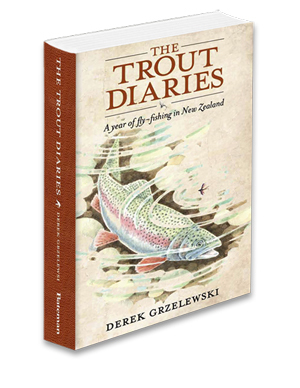 Excerpted from The Trout Diaries, A year of Fly Fishing in New Zealand, with permission from Stackpole Books.